"This guy throws live girls overboard and makes them dead girls, what's funny aboutthat?" Not too long ago, the made-for-TV, USA Films produced Cabin By the Lake, and Return to Cabin By the Lake were released to relatively so-so reactions from the viewing public. For television movies, both have a certain dark undercurrent that rarely goes unchanged in the mainstream realm. On one level, they're more intelligent than what usually passes for entertainment on the USA Network, but you can still feel the heavy tendrils of mediocrity grabbing the good parts and drowning them, much like the unfortunate women in the story. I admire what the filmmakers were reaching for, but it doesn't quite seem to work, which may or may not have been the fault of designing it for television. The first presentation, Cabin By the Lake, stars Judd Nelson as Stanley Caldwell. He's introduced as a screenwriter who's working on the script for a movie about a serial killer. In order to get the best possible insight into his characters, however, he's actually kidnapping girls, drowning them in a nearby lake, and then using their bodies to make an underwater "garden" that he tends in scuba gear. He uses his real-life experiences to pen the film, but as he murders his way into a hit screenplay, he finds that the Hollywood machine is intent on altering and destroying his ideas. In order to spice things up, he decides to kidnap a girl who has more fighting spirit. He hopes this will make things more interesting, but his spree of kidnapings have attracted much more attention than he wanted, including one of his friends, a local deputy sheriff. Cabin By the Lake is pretty clever on one layer: it's a funny concept to have a film be about a guy writing a film and performing the actions in the film. It is a black comedy at heart, and it shows in many of the stylistic choices made in the early moments. Stanley's Hollywood contacts are not only stereotypes for vapid agents and directors, but most of friends work for a gore-effects shop that, ironically, has just been hired to do the effects for the film he is writing (and living). The premise has the potential for brilliance, especially since Judd Nelson is able to carry the role so superbly. Where it really stumbles, though, is when it tries to get actually scary and serious. A subplot is introduced about what makes Stanley psychotic, and the psychological tension between him and his latest kidnapping victim is too heavy-handed for a film that wants to change gears quickly back into a black comedy again. The line separating funny and serious eventually blurs and then fades, leaving behind something that starts out strong, but ends up being not much better than typical 'slasher' genre work. It felt like someone, somewhere thought that making light of these horrible things just wasn't going to be spooky enough, so they tried to go all further and make it terrifying. It doesn't work, though. It saddened me to see such a solid concept erode into little more than a typical made-for-television horror film, but despite those crucial flaws, it still retains a certain level of entertainment. The satire of serial killer films manages to be an element up towards the end of the film, and while not a masterpiece, Cabin By the Lake is reasonable. Certainly worth a try for any horror film fan. 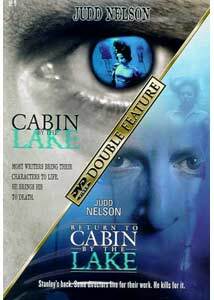 The sequel, Return to Cabin By the Lake, doesn't fare anywhere near as well as the original. This is surprising since it was made by the same writer and director, but regardless, it would seem the project was made to cash in on the original. Judd Nelson appears again as Stanley Caldwell. Exactly how his character is able to work into this film is a mystery to me, but those are the cards we're dealt. Despite the crew-ties to the first film, you wouldn't even know it was the same people, there's such a radical shift in tone and style. To sum up the plot, Stanley (living under the assumed name, J.C. Riddick) manages to sneak his way into Hollywood, becomes a director, and is put in the position of being able to direct his own script for Cabin By the Lake (the film he was working on in the original). It is not explained how he's able to do this, but he does it anyway. While filming his version of his script, he goes back to his murderous desires in order to keep the inspiration going, so he'll be able to muster the proper attitude to make the film work. Return to Cabin By the Lake is a joke, and I mean that in both literally and as an insult. It's as if the filmmakers shot two hours worth of film to say, "Ha ha ha, we're making a movie about when we made that other movie!" The cute factor wears off in about 5 minutes. The story of Stanley directing the movie seems to mimic real-life experiences of making a movie that is actually like Cabin By the Lake. Confused yet? It's like a movie within a movie that's about the making of a movie which is actually inspired by the real-life making of a movie. My head hurts just writing about it. The black humor of the original film is cranked up to a point where it is just not funny. The in-jokes and obvious digs at the filmmaking industry are no longer handled with wit or tact, but are rather just obvious and easy detours to add bad jokes and one-liners. Add to all of this the most important factor of all: there is no story to support a sequel. Whereas the original movie had some great photography and a very tight sense of style (some of the scenes there were literally unforgettable, in terms of visuals), director Po Chih Long decides to go nuts and switch filmstocks every few scenes. One minute, things look composed and well lit; next, the camera work is totally out of control and purposefully hand-held. This new approach to confused me and made the story more embarrassing than it needed to be. I'm unsure what the goals of this sequel were, really, as there seems to be no real connection to the original and no ground to base more adventures of Stanley Caldwell on. He has no relationships with other characters that are significant, because he's now no longer a threat to them (that they know of). Cabin By the Lake was moderately clever, smartly made and acceptable, despite being flawed. They should have just let it rest in peace. Image Transfer Review: The first film has a very impressive transfer that is not only very crisp and clean, but manages to bring out fine details even in the darkest scenes. Compression artifacts are not an issue, and the film benefits greatly from a high bitrate, because the cinematography changes to often. The resulting image really leaps off the screen and can compete with some of the best transfers out there. Even more surprising is that this is a full-frame image. The second film is basically of the same quality, with the exception of the portions filmed in other, more complex film stocks. The quality tends to fluctuate under these circumstances, but the "normal" portions look just as good. Audio Transfer Review: Both films use expansive Dolby 2.0 Surround audio tracks. The surround channel is used quite a bit for ambience and enhancement to the musical score (especially in the first film), and the effects are never far off balance with the front speakers. The rest of the audio is well designed, with crisp dialogue and good placement of sound effects. One of the most obvious uses of directionality is during the split-screen sequences often used; the left side of the screen's activity comes out of the left speaker and so on. Overall, this is an impressive, theatrical track that really makes the material sound better than what you expect from something made for cable. Extras Review: There aren't really any supplements to speak of. The keepcase insert has some production notes about the films and the overall presentation fits the mood well. More chapter stopscould have been used, though. The Cabin By the Lake double feature is a mixed bag of good ideas diluted by bad ones. Horror fans will appreciate some of the twists on the usual, but the problem is that the twists then become the usual after awhile. If you're a fan of these Cabin By the Lake films, this disc is definitely worth picking up, not only for giving you both on one disc, but providing very good image and sound quality as well.